Cold snaps hold no fear when you’ve got merino. 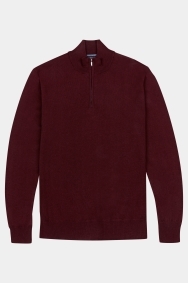 With its rich, deep tone and use of warm merino wool, this Italian-made jumper from Moss 1851 is a good friend to have in the chillier seasons. Designed to work as well in an office environment as it does in a chic bar or restaurant, it’ll provide you with plenty of options whatever the occasion. Team with a light-coloured formal shirt, leaving the quarter zip open to complete a relaxed yet stylish appearance. Overall, the purchase met the expectations of purchasing activity. Quality of material adds emotional value to the product. Love this! I got it for my dad and he uses every excuse to wear it as he’s a lazy dresser and finds this easy without making mum mad about his clothes ??? ?